Founded in 1995 in Uppsala, Sweden, Medicago is celebrating more than 20 years of continuous service to the life science research, biotechnology and pharmaceutical industries. We specialize in the design, development and manufacture of user-friendly research bio-reagents plus diagnostic and biochemical kits in standard pack sizes as well as bulk. We are privately owned, enthusiastic, forward-looking and committed to deliver world-class services for our customers. As the company continue to evolve, we have increased our presence and operations throughout the world. Continuously we are reinforcing our product portfolio and developing new products for additional markets for instance molecular biology, dietary supplements and nutraceuticals. Medicago has successfully grown over the years because of short decision times, market responsiveness and the ability to customize and provide innovative solutions for customers. 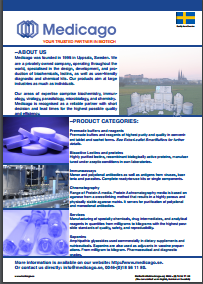 We develop and manufacture a wide range of SmartBuffers and SmartReagents of the highest purity, pre-mixed and supplied in convenient tablets or powder pouches. 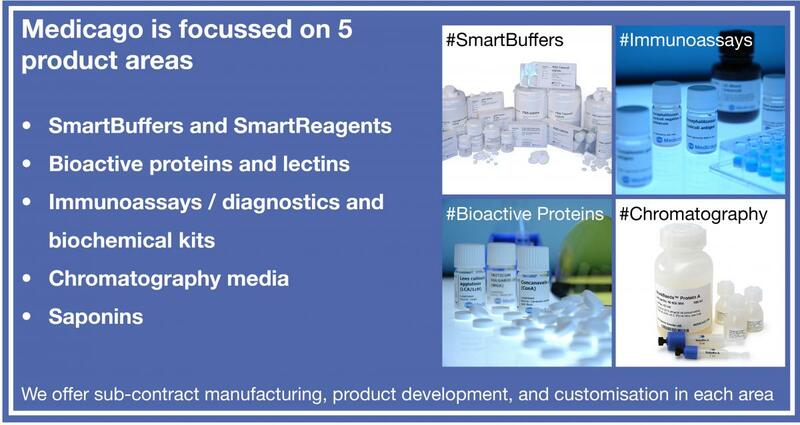 SmartBuffers and SmartReagents save valuable time in routine laboratory work while providing maintained or even increased precision. Exceptionally pure lectins purified by affinity chromatography. Medicago is one of the worlds few primary manufacturers of lectins. These proteins were the first products manufactured and marketed by Medicago. Even today, we remain one of the world’s few primary manufacturers of extremely pure lectins. Our extensive expertise in this area makes us the ideal partner for customized solutions. Medicago develops and manufactures monoclonal and polyclonal antibodies, as well as antigens from viruses, bacteria and parasites. Over the last decade, we have built up a substantial body of expertise in this important area. Our diagnostic kits for in vitro use are based on well-proven ELISA and monoclonal antibody techniques. Medicago's Bioactive Proteins include the calcium-binding protein Calmodulin and other custom-made proteins. We have extensive experience in the development and production of proteins. If you don't find the protein you are looking for we can certainly produce it for you. Try us! Medicago is one of few manufacturers of saponins. These are provided in bulk and custom in both pharmaceutical and diagnostic grade. In addition to our standard product range, we manufacture according to customer specifications and sub-contracting agreements. We welcome requests for custom, bulk and OEM in any of our product areas. Our DIN EN ISO 9001:2015 and 13485:2016 quality management system ensures that your special requests are handled and delivered quickly, efficiently and accurately. Our goal, as always, is to help you achieve success.